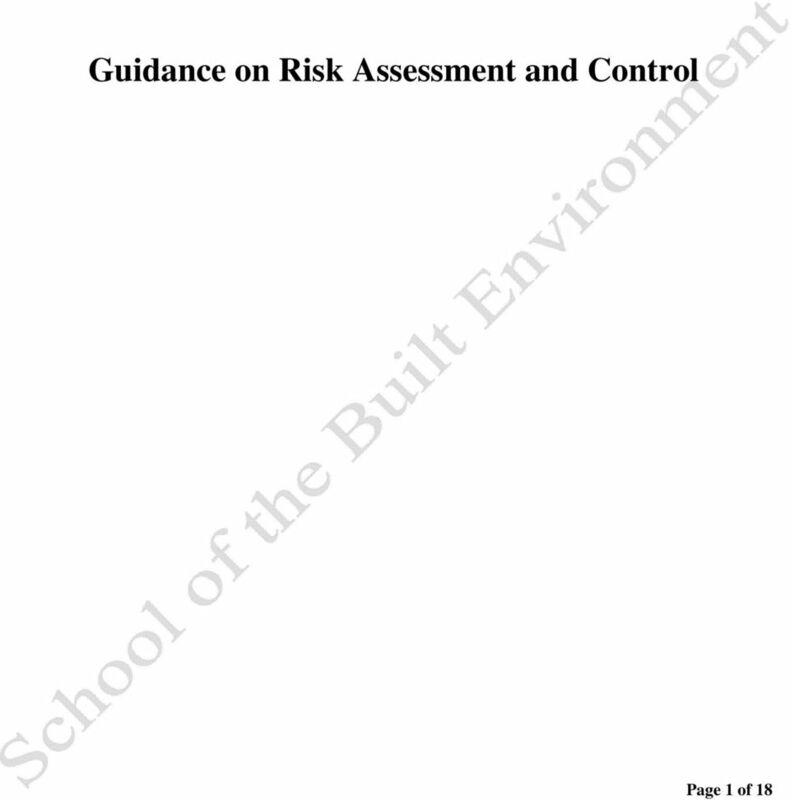 Download "Guidance on Risk Assessment and Control"
3 Executive Summary The need to conduct risk assessments and to implement measures to ensure health and safety based on the outcome of these assessments has always been a fundamental principle of health and safety management. In addition, it has been a specific legal requirement since This document describes a widely accepted structured approach to conducting risk assessments. The approach is likely to be new to many, and an important component of the process is the need for those conducting risk assessments to receive appropriate training. 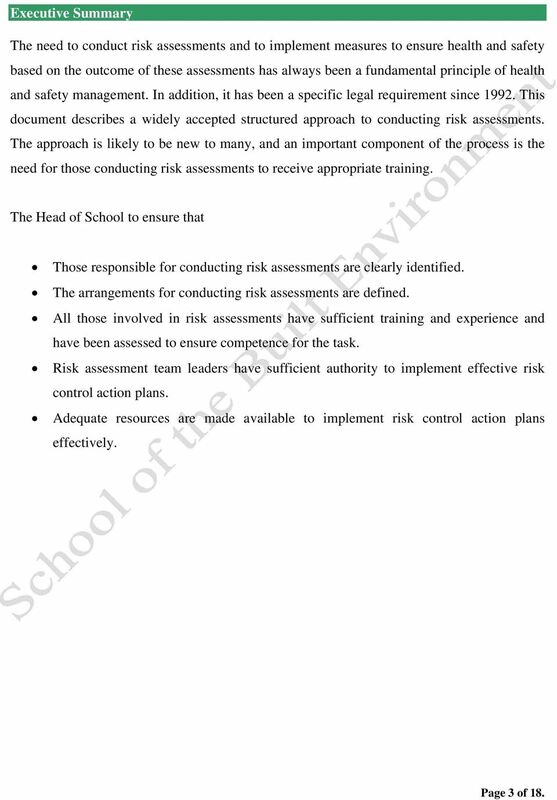 The Head of School to ensure that Those responsible for conducting risk assessments are clearly identified. The arrangements for conducting risk assessments are defined. All those involved in risk assessments have sufficient training and experience and have been assessed to ensure competence for the task. Risk assessment team leaders have sufficient authority to implement effective risk control action plans. Adequate resources are made available to implement risk control action plans effectively. Page 3 of 18. 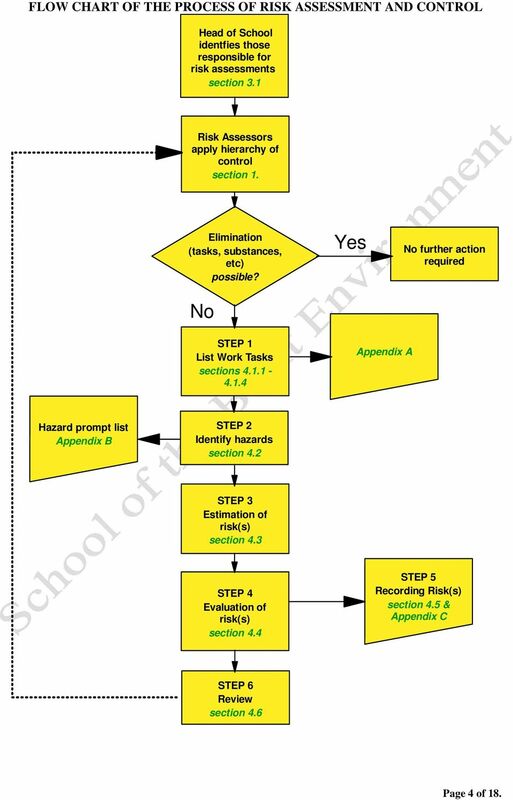 4 FLOW CHART OF THE PROCESS OF RISK ASSESSMENT AND CONTROL Head of School identfies those responsible for risk assessments section 3.1 Risk Assessors apply hierarchy of control section 1. Elimination (tasks, substances, etc) possible? No Yes No further action required STEP 1 List Work Tasks sections Appendix A Hazard prompt list Appendix B STEP 2 Identify hazards section 4.2 STEP 3 Estimation of risk(s) section 4.3 STEP 4 Evaluation of risk(s) section 4.4 STEP 5 Recording Risk(s) section 4.5 & Appendix C STEP 6 Review section 4.6 Page 4 of 18. 5 1. INTRODUCTION AND SCOPE The University is required by law to conduct risk assessments for any work activity or procedure it carries out. This document provides guidance on how to carry out risk assessments and implement control and risk reduction strategies for work activities. It is strongly recommended that at least one member of any risk assessment team has received appropriate training. More complex risk assessment methodologies will require specialist skills and advice must be sought from the University Health, Safety and Risk Office before carrying out this type of risk assessment. 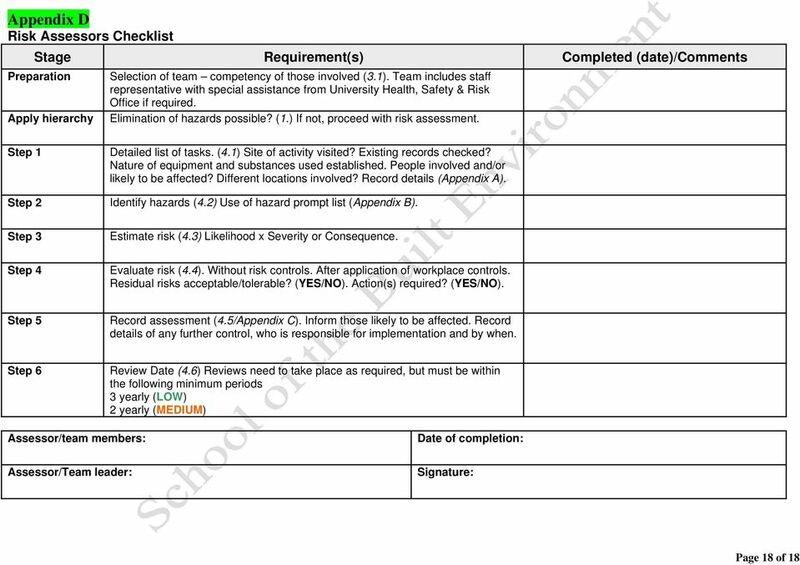 The guidance includes a copy of the risk assessment record form, and assessments must be recorded in this format. 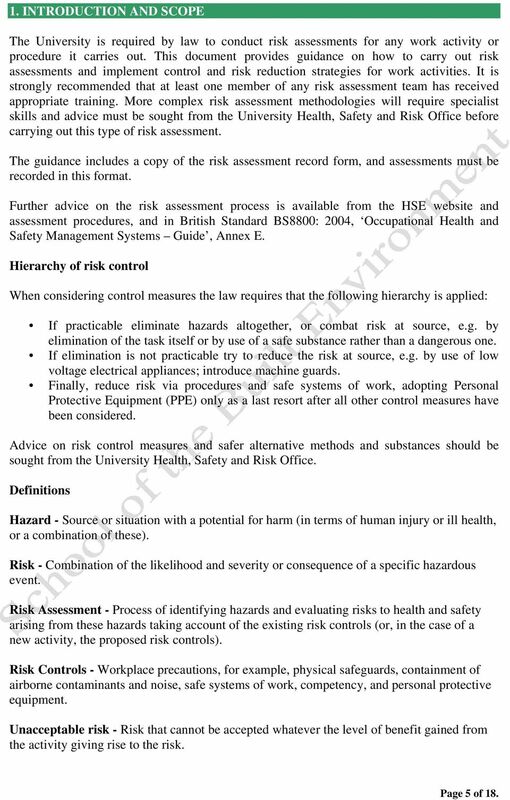 Further advice on the risk assessment process is available from the HSE website and assessment procedures, and in British Standard BS8800: 2004, Occupational Health and Safety Management Systems Guide, Annex E. Hierarchy of risk control When considering control measures the law requires that the following hierarchy is applied: If practicable eliminate hazards altogether, or combat risk at source, e.g. by elimination of the task itself or by use of a safe substance rather than a dangerous one. If elimination is not practicable try to reduce the risk at source, e.g. by use of low voltage electrical appliances; introduce machine guards. Finally, reduce risk via procedures and safe systems of work, adopting Personal Protective Equipment (PPE) only as a last resort after all other control measures have been considered. Advice on risk control measures and safer alternative methods and substances should be sought from the University Health, Safety and Risk Office. Definitions Hazard - Source or situation with a potential for harm (in terms of human injury or ill health, or a combination of these). Risk - Combination of the likelihood and severity or consequence of a specific hazardous event. Risk Assessment - Process of identifying hazards and evaluating risks to health and safety arising from these hazards taking account of the existing risk controls (or, in the case of a new activity, the proposed risk controls). Risk Controls - Workplace precautions, for example, physical safeguards, containment of airborne contaminants and noise, safe systems of work, competency, and personal protective equipment. Unacceptable risk - Risk that cannot be accepted whatever the level of benefit gained from the activity giving rise to the risk. Page 5 of 18. 6 Tolerable risk -Risk at a level that can be accepted provided risk controls are implemented to reduce risk as low as is reasonably practicable, i.e. reduced to a point where it can be shown that the costs (in terms of time, money and/or effort) of further risk reduction would be disproportionate to the further benefits. Acceptable risk - Risk that is regarded as insignificant either as it stands, or as a result of risk controls. 2. RELATED DOCUMENTS BS OHSAS 18001:2007 BS8800: 2004 Occupational Health and Safety Management Systems Guide Management of Health and Safety at Work Regulations (Reg. 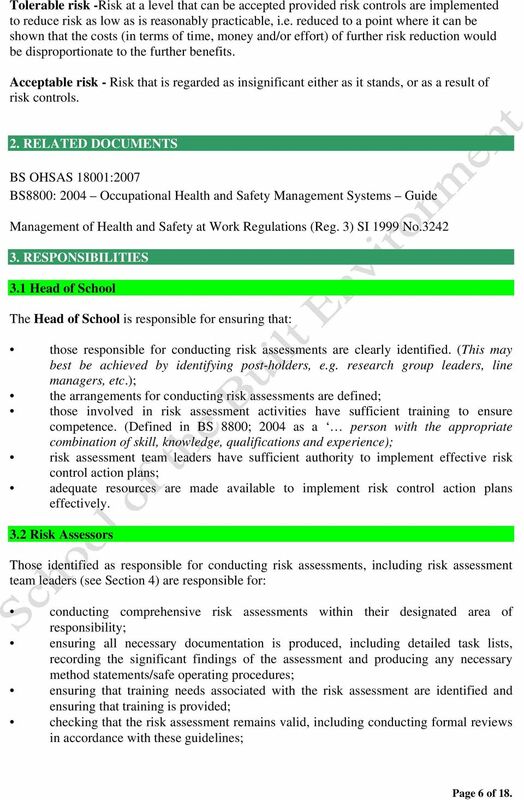 3) SI 1999 No RESPONSIBILITIES 3.1 Head of School The Head of School is responsible for ensuring that: those responsible for conducting risk assessments are clearly identified. (This may best be achieved by identifying post-holders, e.g. research group leaders, line managers, etc. ); the arrangements for conducting risk assessments are defined; those involved in risk assessment activities have sufficient training to ensure competence. (Defined in BS 8800; 2004 as a person with the appropriate combination of skill, knowledge, qualifications and experience); risk assessment team leaders have sufficient authority to implement effective risk control action plans; adequate resources are made available to implement risk control action plans effectively. 3.2 Risk Assessors Those identified as responsible for conducting risk assessments, including risk assessment team leaders (see Section 4) are responsible for: conducting comprehensive risk assessments within their designated area of responsibility; ensuring all necessary documentation is produced, including detailed task lists, recording the significant findings of the assessment and producing any necessary method statements/safe operating procedures; ensuring that training needs associated with the risk assessment are identified and ensuring that training is provided; checking that the risk assessment remains valid, including conducting formal reviews in accordance with these guidelines; Page 6 of 18. 7 monitoring that people are working in accordance with the outcome of the risk assessment. 3.3 School Safety Officer The School Safety Officer is responsible for: coordinating the risk assessment process in the School and, where necessary, leading teams for more complex risk assessments, and if deemed appropriate with the assistance of the University Health, Safety and Risk Office. 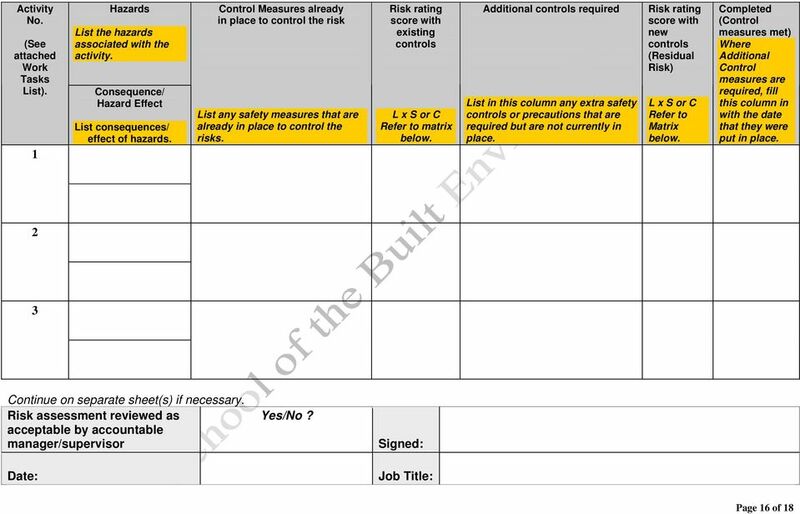 setting up a Risk Register to ensure that all significant hazards present within the School can be identified, and measures implemented to eliminate or reduce risk to an acceptable or tolerable level. 3.4 University Health, Safety and Risk Office The University Health, Safety and Risk Office is responsible for providing: advice on the risk assessment process and methods of risk reduction, in particular for circumstances requiring more complex risk assessment technique; and, training for those responsible for carrying out risk assessments. 3.5 Members of the School All members of the School are responsible for: working in accordance with the findings of risk assessments, e.g. using the appropriate control measures; attending training identified as part of the risk control action plan; the prompt reporting of deficiencies in risk control measures, including those arising from changes in working conditions, staffing levels and change in equipment condition. 4. CARRYING OUT RISK ASSESSMENTS Risk assessments are a team activity, involving a manager/leader with devolved responsibility and authority, any relevant line supervisors/managers and those directly involved in the work. 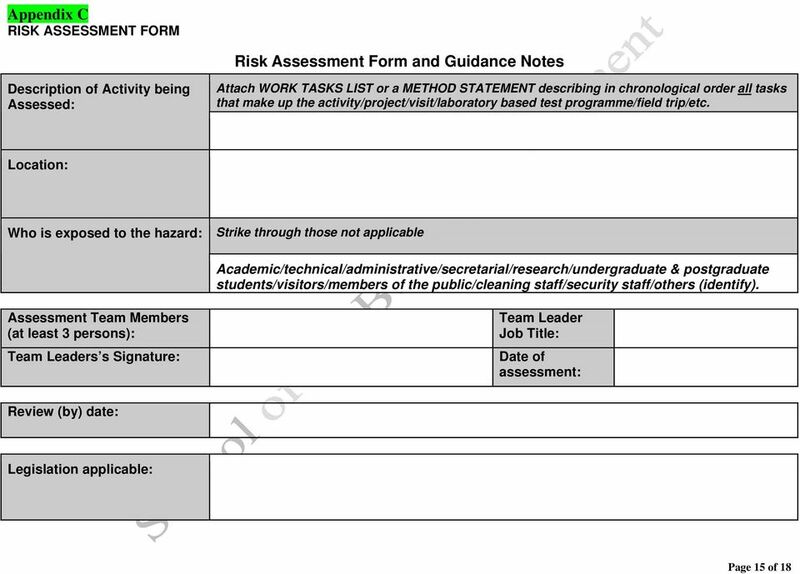 For example, a risk assessment for a research group in a laboratory may involve a postdoctoral researcher drafting an initial risk assessment for a project which is then discussed with other members of the project team before being signed off by the project s leader/supervisor. Risk assessment should not be unnecessarily complicated. What is important is that assessors concentrate on significant hazards which could result in serious harm or affect one or more people. When carrying out a risk assessment, assessors need to: STEP 1: classify work activities - make a detailed list of the work tasks that are relevant to the activity/project/area of responsibility. 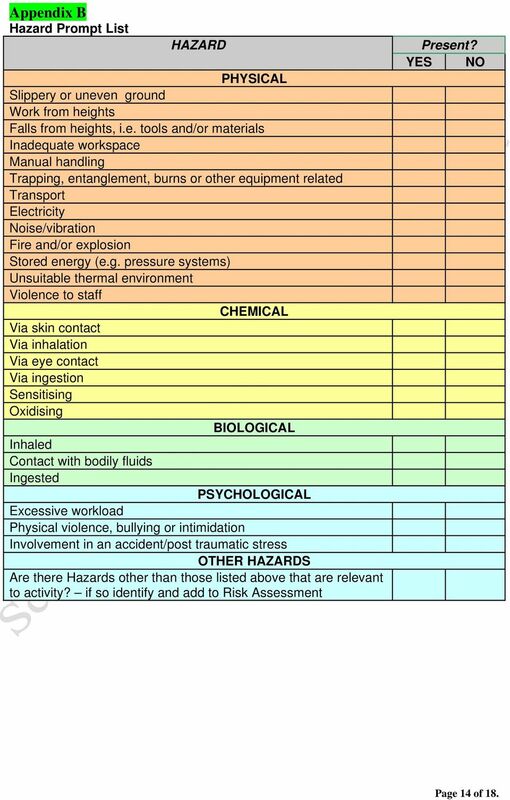 STEP 2: identify the hazards what are the hazards, who might be harmed and Page 7 of 18. 8 how? Once this information has been recorded the assessors can then: STEP 3: estimate the risk STEP 4: evaluate the risk Finally, the assessors must: STEP 5: record their findings STEP 6: (periodically) review the findings. 4.1 STEP 1- Classifying Work Activities Appendix A provides an example of a template for recording the information required in STEP Description of the activity areas/locations The assessor(s) is required to make a detailed list of the work tasks involved in the activity/project/etc. This should include the activities that take place, the people involved in those activities, the equipment being used and if appropriate the different locations (as this can be a hazard in some circumstances). One of the most effective ways of ensuring that all activities are listed is to walk around the area/location where the tasks are to be undertaken and see what else is going on as it is possible that a hazard could be overlooked without a site visit. The School Safety Officer can produce a health and safety risk register for the School by combining the lists of these work activities People likely to be affected Consideration needs to be given to who might be affected by any task or operation. Although in many cases this will be restricted to those carrying out the work, it is also important to consider those who might be visiting or passing through a given work area, and anyone who could be affected beyond the area of normal operation, e.g. in an emergency or in abnormal situations. Special consideration should be given to the implications of youth, age, impaired health and pregnancy Permanent and temporary pieces of equipment and substances used at the location Hazards associated with equipment and substances will vary according to factors such as frequency of use, quantities of materials involved, etc. Details of the type, nature and operating environment of equipment should be recorded, along with information about inspection and maintenance regimes Activities carried out at different locations Page 8 of 18. 9 Certain activities may be carried out at more than one location and changes in circumstance may have implications for the risk assessment. Where circumstances are significantly different between locations it is recommended that a separate risk assessment is carried out. 4.2 STEP 2 - Identifying the hazards Having established the tasks the assessor(s) must then identify what hazards are present, who might be harmed and how. Techniques for achieving this include: observation of the physical layout at each area/location and the activities being carried out; consultation with staff and their representatives; inspection of relevant School Service records including accident reports, audit/inspection records, Risk Register etc. 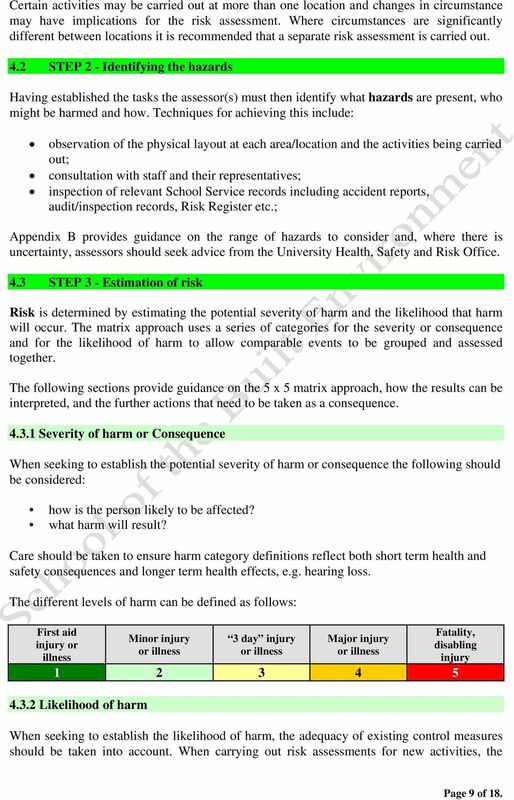 ; Appendix B provides guidance on the range of hazards to consider and, where there is uncertainty, assessors should seek advice from the University Health, Safety and Risk Office. 4.3 STEP 3 - Estimation of risk Risk is determined by estimating the potential severity of harm and the likelihood that harm will occur. The matrix approach uses a series of categories for the severity or consequence and for the likelihood of harm to allow comparable events to be grouped and assessed together. 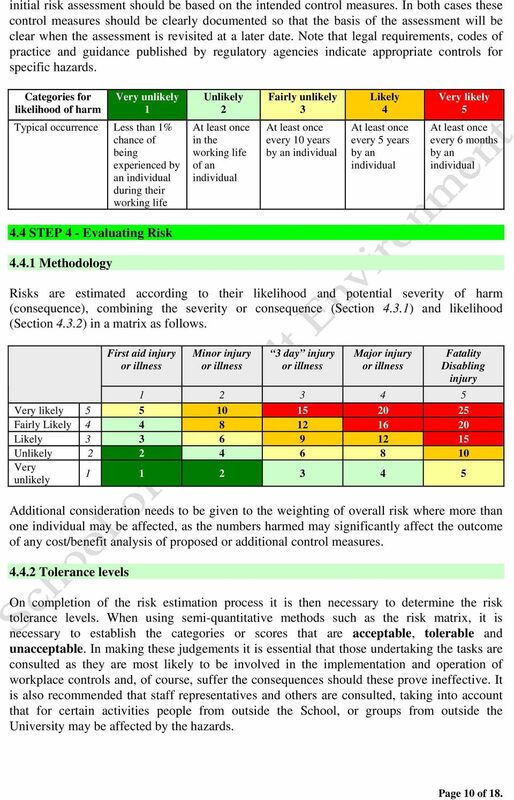 The following sections provide guidance on the 5 x 5 matrix approach, how the results can be interpreted, and the further actions that need to be taken as a consequence Severity of harm or Consequence When seeking to establish the potential severity of harm or consequence the following should be considered: how is the person likely to be affected? what harm will result? Care should be taken to ensure harm category definitions reflect both short term health and safety consequences and longer term health effects, e.g. hearing loss. The different levels of harm can be defined as follows: First aid injury or illness Minor injury or illness 3 day injury or illness Major injury or illness Fatality, disabling injury Likelihood of harm When seeking to establish the likelihood of harm, the adequacy of existing control measures should be taken into account. When carrying out risk assessments for new activities, the Page 9 of 18. 10 initial risk assessment should be based on the intended control measures. In both cases these control measures should be clearly documented so that the basis of the assessment will be clear when the assessment is revisited at a later date. Note that legal requirements, codes of practice and guidance published by regulatory agencies indicate appropriate controls for specific hazards. Categories for likelihood of harm Very unlikely 1 Unlikely 2 Fairly unlikely 3 Likely 4 Very likely 5 Typical occurrence Less than 1% chance of being experienced by an individual during their working life At least once in the working life of an individual At least once every 10 years by an individual At least once every 5 years by an individual At least once every 6 months by an individual 4.4 STEP 4 - Evaluating Risk Methodology Risks are estimated according to their likelihood and potential severity of harm (consequence), combining the severity or consequence (Section 4.3.1) and likelihood (Section 4.3.2) in a matrix as follows. First aid injury or illness Minor injury or illness 3 day injury or illness Major injury or illness Fatality Disabling injury Very likely Fairly Likely Likely Unlikely Very unlikely Additional consideration needs to be given to the weighting of overall risk where more than one individual may be affected, as the numbers harmed may significantly affect the outcome of any cost/benefit analysis of proposed or additional control measures Tolerance levels On completion of the risk estimation process it is then necessary to determine the risk tolerance levels. When using semi-quantitative methods such as the risk matrix, it is necessary to establish the categories or scores that are acceptable, tolerable and unacceptable. In making these judgements it is essential that those undertaking the tasks are consulted as they are most likely to be involved in the implementation and operation of workplace controls and, of course, suffer the consequences should these prove ineffective. It is also recommended that staff representatives and others are consulted, taking into account that for certain activities people from outside the School, or groups from outside the University may be affected by the hazards. Page 10 of 18. 11 To establish what is acceptable and to set priorities for the implementation of control measures, the School has established tolerance criteria to provide a basis of consistency in all its risk assessments as shown below: Category of risk Very low ( score 1-2) Low (Score 3 4) Medium (score 5 8) Medium (score 9 14) High (score 15 or above) Evaluation of tolerability Acceptable. Tolerable however actions should be taken to reduce risks so that they become acceptable. Unacceptable. Note that in deciding the tolerance levels for risks from particular hazards, account should be taken of individuals' total exposure to risk, allowing for the fact that they could be exposed to a number of risks associated with a number of different hazards, or to different attributes of the same hazard. The individual risk exposure of members of special groups should also be considered, e.g. vulnerable groups such as new or inexperienced workers, or those most directly involved in the highest risk activities (i.e. the most exposed group of workers). Note also that dividing time spent on a hazardous activity between several individuals is should not a valid risk reduction measure. Risk from individual hazards should be tolerable irrespective of individual exposure to the hazard; an unacceptable risk does not become tolerable if exposure to it is limited to a short time. 4.5 STEP 5 - Record assessment Risk assessment records enable the School to demonstrate that it has systematically identified all its significant hazards, evaluated the associated risks, and implemented adequate control measures. With the exception of situations where research staff and students are permitted to record individual risk assessments within their lab books/project reports/thesis, risk assessments should be recorded in an easily recognisable and retrievable format. 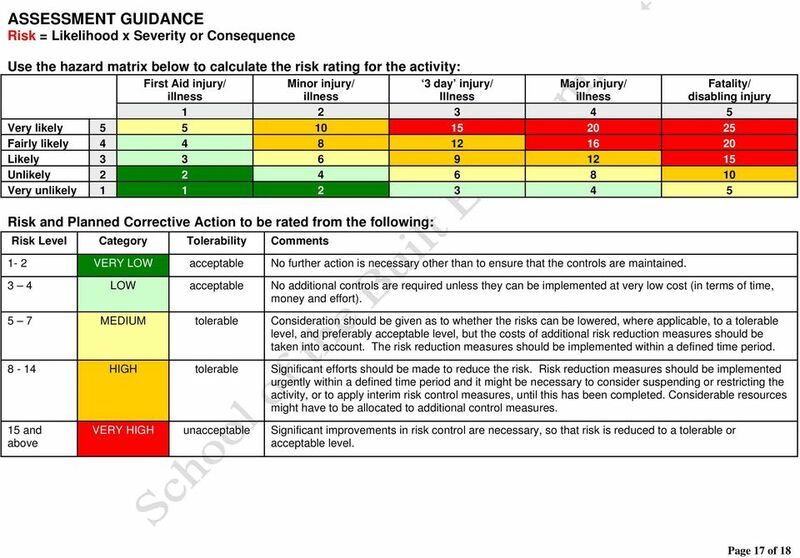 The risk assessment record form to be used within the School is shown in Appendix C and is available separately. The form must include details of any further actions required, along with the identity of those responsible for the action(s), and agreed timescale for completion. Review of these actions will be covered as part of the School inspection and audit programme and any significant outcomes included in the annual review of School Safety policy. Assessments should be signed by the assessor(s) and countersigned by the designated accountable manager/leader/supervisor. Copies of risk assessments are to be made available to those likely to be affected, and should be readily available at the immediate workplace, e.g. in the laboratory. Additionally, in many cases it will be necessary to transpose the outcome of an assessment into other documentation to provide instruction about how tasks should be carried out. For example, the outcome of risk assessments should be used to write Safe Operating Procedures (SOPs), work sheets, Page 11 of 18. 12 rules, etc. 4.6 STEP 6 Review Risk assessment and control is a continual process. Where appropriate risk assessments will be subject to periodic formal review to confirm the validity of the assessment and whether risk controls are still effective and adequate. Formal reviews of all risk assessments will be carried out at least every 3 years for low risk activities and every two years for medium risk activities. Where conditions have changed improvements should be made as necessary. 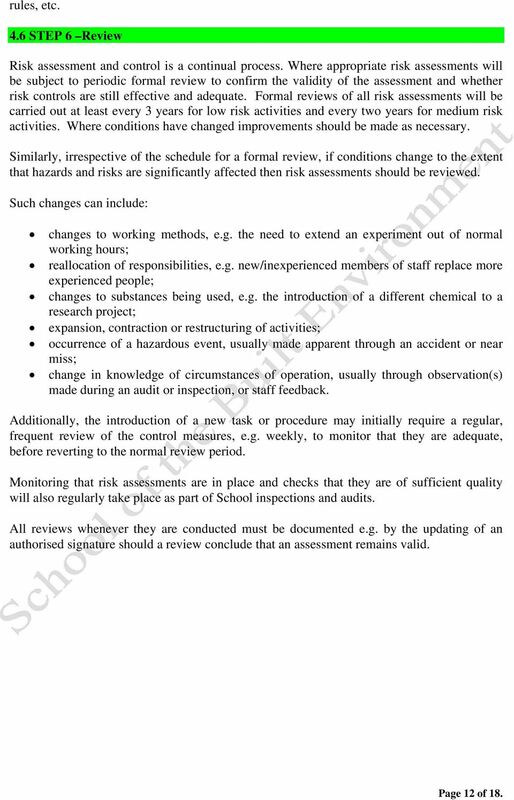 Similarly, irrespective of the schedule for a formal review, if conditions change to the extent that hazards and risks are significantly affected then risk assessments should be reviewed. Such changes can include: changes to working methods, e.g. the need to extend an experiment out of normal working hours; reallocation of responsibilities, e.g. new/inexperienced members of staff replace more experienced people; changes to substances being used, e.g. the introduction of a different chemical to a research project; expansion, contraction or restructuring of activities; occurrence of a hazardous event, usually made apparent through an accident or near miss; change in knowledge of circumstances of operation, usually through observation(s) made during an audit or inspection, or staff feedback. Additionally, the introduction of a new task or procedure may initially require a regular, frequent review of the control measures, e.g. weekly, to monitor that they are adequate, before reverting to the normal review period. Monitoring that risk assessments are in place and checks that they are of sufficient quality will also regularly take place as part of School inspections and audits. All reviews whenever they are conducted must be documented e.g. by the updating of an authorised signature should a review conclude that an assessment remains valid. Page 12 of 18. 13 Appendix A Work Tasks List Project Identification Details: Activity No. 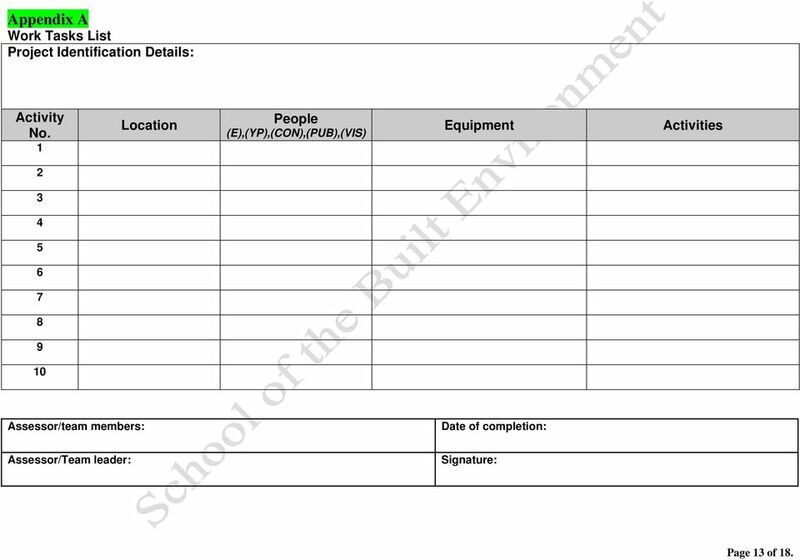 1 Location People (E),(YP),(CON),(PUB),(VIS) Equipment Activities Assessor/team members: Date of completion: Assessor/Team leader: Signature: Page 13 of 18. 14 Appendix B Hazard Prompt List HAZARD PHYSICAL Slippery or uneven ground Work from heights Falls from heights, i.e. tools and/or materials Inadequate workspace Manual handling Trapping, entanglement, burns or other equipment related Transport Electricity Noise/vibration Fire and/or explosion Stored energy (e.g. pressure systems) Unsuitable thermal environment Violence to staff CHEMICAL Via skin contact Via inhalation Via eye contact Via ingestion Sensitising Oxidising BIOLOGICAL Inhaled Contact with bodily fluids Ingested PSYCHOLOGICAL Excessive workload Physical violence, bullying or intimidation Involvement in an accident/post traumatic stress OTHER HAZARDS Are there Hazards other than those listed above that are relevant to activity? if so identify and add to Risk Assessment Present? YES NO Page 14 of 18. Hazard/Risk Identification and Control Procedure Introduction Hazard identification and the steps taken to minimize the risks associated with identified hazards are a critical component of working safely. Walk around and identify the area to be assessed and look at what could reasonably be expected to cause harm. It is recognised that in order to be considered competent to carry out risk assessment training will be necessary. The successful implementation of this policy can only be achieved by co-operative effort at all levels within the organisation. Occupational Health and Safety Division Elements of an Occupational Health and Safety Program Table of Contents Introduction 3 What workplaces must have a program? 5 What criteria must the program meet? identify hazards, analyze or evaluate the risk associated with that hazard, and determine appropriate ways to eliminate or control the hazard. Overview Step 1. Identify Hazards Step 2. Assess the Risks Assess the Likelihood & Consequences Classify the Risk Step 3. Control the Risks The hierarchy of risk control can be used as a guide Step 4. Guidance on Risk Assessment: Contents 1. Introduction Page 1 2. Definitions Page 2 3. 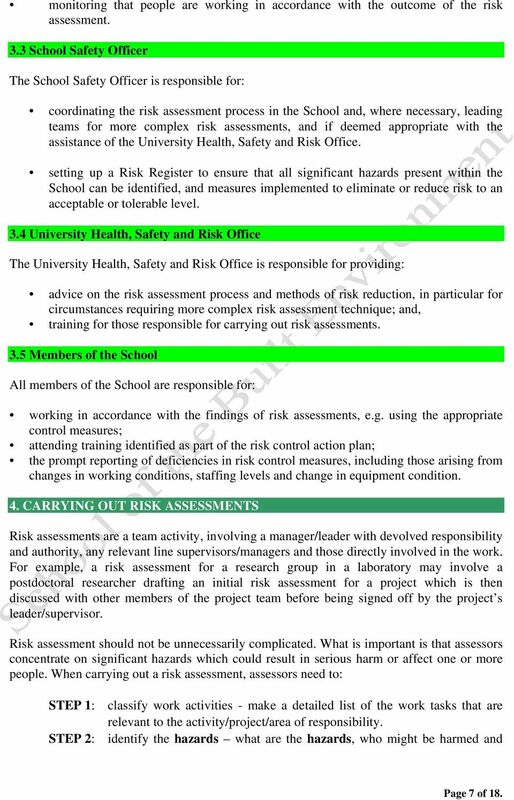 Responsibilities for Risk Assessment Page 2 4. Choosing and Assessor Page 2 5. The Risk Assessment Process Page 3 6.
starting your Health and safety program Introduction Workplace injuries and illnesses can be prevented. The key to achieving safe production is to identify and control all workplace health and safety hazards. Guidance Undertaking General Risk Assessments Guidance on Undertaking General Risk Assessments CONTENTS Page 1. Introduction 2 1.1 University Policy & Legal Obligations 1.2 Aim and Scope of Guidance 2. Office of Advocacy. Occupational Safety and Health Administration's (OSHA) Draft Proposed Safety and Health Program Rule 29 CFR 1900. The Police Treatment Centres Health and Safety Legal Compliance Register No. Name of Legislation Applicable Issues and Requirements Demonstration of Compliance 1. Health and Safety at Work Act 1974 2.